Thank you to those who have tried to solve this month’s Crocodile mystery regarding the yellow color of a book, which can be found in the Stickelberger collection of Reformation at the Folger Shakespeare Library (more on this collection in a future Collation post!). While we had many interesting guesses, we still cannot fully explain what caused the coloring of the paper in this book. Except for the white flyleaves, the textblock is on yellow paper with some leaves showing a green shade shift at the tidelines. 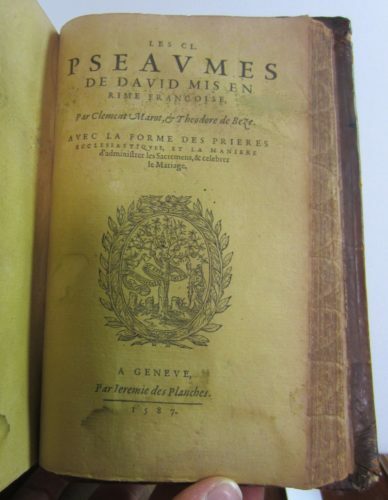 Two texts are bound in the volume: first a revised edition of the French version of the Geneva Bible from 1588 prepared by Theodore de Bèze among other theologians, second a translation of the Psalms by Clément Marot and Theodore de Bèze from 1587.1 The printer Jérémie des Planches is thought to have printed both works in Geneva, although his name does not appear in the first text. The title page of the Geneva Bible bound first in this sammelband (Folger Shakespeare Library, 218- 038q item 1). Photograph by the Folger Conservation Department. 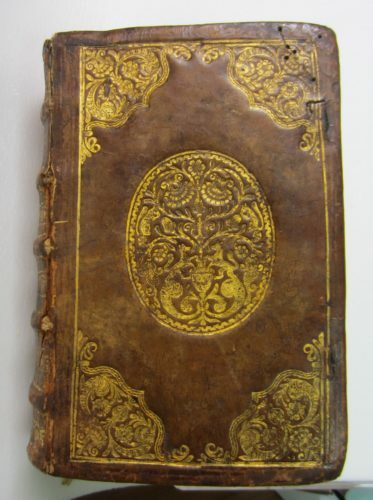 The Marot edition of the Psalms from 1587 bound second in our volume. (Folger Shakespeare Library, 218- 038q item 2). Photo by Caroline Duroselle-Melish. Paper can be colored either or during the papermaking process. In his Craftsman’s Handbook, the artist Cennino Cennini describes how to tint pre-made paper. After having prepared the colorant, “lay some of [it] evenly over the ground of your paper, running your hand lightly, with the brush about half dry, first in one direction and then in the other. And put on three or four coats of it in this way, or five, until you see that the paper is tinted evenly. And wait long enough between one coat and the next for each coat to dry … When it is dry and done, take a penknife, and rub lightly over the tinted sheet with the blade, so as to remove any little roughness that there may be on it.”2 Cennini’s text stresses how time consuming and difficult it is to color paper and obtain an even tint throughout the sheet. This would also have been true when a colorant was added at the pulp-making stage. Folger conservators have looked at our sammelband. They could not determine for sure whether or not the colorant was applied during the papermaking process. One may advance the theory, though, that it was tinted after the two texts were printed. A strong argument to support this is that the two texts were printed in two different years and no other extant copies of either these editions of the Geneva Bible or of Marot’s Psalms are recorded with paper of this color. Orlando Furioso, on blue paper. PQ4567.A2 1544 Cage. Photo by Caroline Duroselle-Melish. Overall, though, books were not printed on colored paper because it could make reading their text difficult and it would not have been cost effective. By contrast, artists would sometimes use dyed paper to enhance their drawings and achieve certain artistic effects; but they would work on single sheets of colored paper, not a whole volume’s worth. Our volume including a Geneva Bible and Psalms is, thus, a bit of an odd thing. Its paper was most likely colored for one of the owners of the book before being bound (or rebound) together. Two manuscript inscriptions dated from 1675 and 1753 on the front flyleaves of the book give us an idea of the period when the two texts may have been bound together. 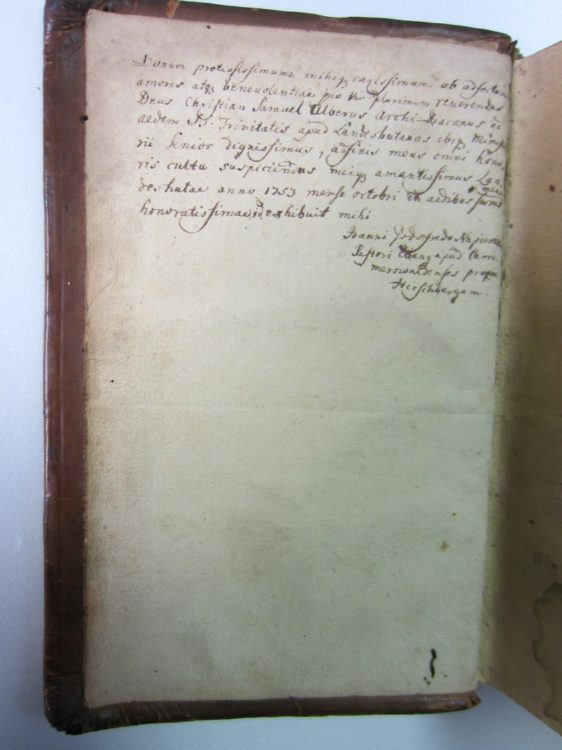 In the second manuscript note, we learn that an archdeacon from the Bavarian town of Landshut gave this book to a pastor near the town of Hirschberg (there are several towns in Germany and Switzerland with this name so it is yet to be determined to which one this inscription is referring). Inscription in Latin on the verso of the front flyleaf of the sammelband (Folger Shakespeare Library, 218- 038q items 1-2) Photo by Caroline Duroselle-Melish. Could one of these men have had the paper of this book colored and why anyone would want to have a yellow Calvinist Bible? One possible explanation is that the coloring was intended to imitate gold. Indeed, the paper would have been of a much brighter color when it was first tinted than it appears today (the fading of the yellow color around the edges of the textblock indicates that the colorant used was not stable and probably shifted over time). 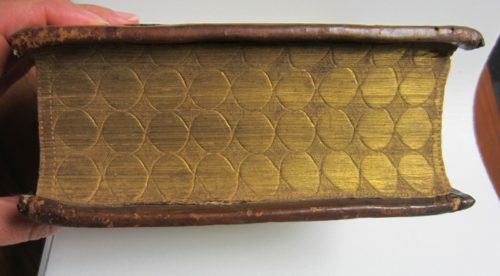 A bright paper would have matched the binding in which the book is still housed: a fairly elaborate binding with gold stamping decorations and gauffered gilt edges. Both paper and binding reflect the taste of someone who liked gold and perhaps wished to embellish these religious texts so that their physical form matched the importance of the content. Yet, it would have been a long and difficult process to obtain an even coloring on 50 sheets of paper or more (that is roughly the number of sheets used to print the Geneva Bible and the Psalms in octavo format in our volume). We certainly hope that the craftsman used a faster coloring method than the one described by Cennini. Weld dye and turmeric are two known colorants used during this period to make yellow. Weld dye was then readily available throughout Europe and would have been cheaper to obtain than turmeric. In both cases, a mordant would have been used to fix the dye on the fiber of the paper. So the mystery about our book remains. Our conservators have promised to do more research on it so stay tuned. Perhaps someday we’ll be back with a more satisfactory answer. Full descriptions of these two titles may be found in our catalog: the Geneva Bible and the Psalms. Caroline Duroselle-Melish is the Andrew W. Mellon Curator of Early Modern Books and Prints at the Folger. Our thanks to Caroline Duroselle-Melish for this fine essay. I’ve just posted a notice on the piece on c18-L (the 18th Century List), apropos a recent query posted by Wm McCarthy (emeritus, Iowa) on the use of color (or colored) paper in printed books, thus extending exposure of Caroline’s good work. And superb images, I hasten to add. Maureen E. Mulvihill (PhD), Scholar & Collector. Princeton Research Forum, Princeton NJ. Profile, with photo, Mulvihill Collection: Fine Books & Collections magazine, Autumn 2016. Harry Stack Sullivan was an eminent psychiatrist who chose yellow paper for a journal he founded. He claimed it was easier on the eyes. It continued to be known informally as the “Yellow Journal” until a more recent editor chose to go the conventional route. A white powdery substance adheres to many pages of the Marot-Beza Psalter and possibly the OT as well. This substance might be a residue from the dyeing of the paper following printing as I doubt that it would have survived the wetting down of paper prior to printing. Many pages in the Psalter also bear fine pitting that might be the result of dyeing. There is a yellow Tyndale Bible in the rare book collection at Ohio State University, and a student there named Ashley Bartman did her best to find out how and why the paper got yellow: http://kb.osu.edu/dspace/handle/1811/51868. She did not come up with any definitive answers but has some interesting thoughts. Books on yellow paper are uncommon but not perhaps as ‘extremely rare’ as you suggest. The British Library has four : Precationes Biblicae (Lyons, 1545), 3456.aa.37; Homer (Basle, 1551), G.9016; Great Bible (London, Grafton, 1553), C.36.f.13; Bible (Amsterdam, 1613), 3036.g.12. Cambridge University Library has seven: Goodly Prymer (London, Byddell, ), Rit.d.753.2; Book of Common Prayer (London, Barker, ) and Metrical Psalms (London, Day, 1571), SSS.23.4; Geneva Bible (London, Barker, 1586), BSS.201.B86; Great Bible (London, Hill, 1552), SSS.22.3; Coverdale New Testament (London, Wolfe, 1549), BSS.201.B49.15; Fitzherbert, Natura Brevium (London, Wight & Norton, 1598), Syn.7.59.20; Greek New Testament (Basle, 1531), BSS.130.B31. The Bodleian has two: Great Bible (London, Grafton & Whitchurch, 1540), Denyer N.T. Eng.d.1540; Book of Common Prayer (London, Norton & Bill, 1618), C.P. 1618.e.1. See also ‘Early printed books on tinted paper’, in the Book Collector, 19 (1970), pp 99 and 383-4. My theory is that the yellow paper was thought to make the book easier on the eyes (because a sharp contrast between black type and white paper was thought to be hurtful to the eyes) and was therefore favoured for bibles, prayer books and other books that were likely to receive frequent and intensive reading. March 2017’s Crocodile mystery puzzled over a Sammelband whose text blocks were on yellow paper. The mystery deepens: it’s not alone. I’ve been informally keeping a running list for several years, which now numbers about four or five dozen other books with yellow text blocks. (As a preliminary working list, it includes those I’ve seen in person or in reproduction as well as that I’ve learned about but not yet verified.) Most were printed in London or Antwerp (presumably for the English market), especially c.1540–1560, but a few were printed in the early 1600s and one was printed as late as the 1790s. Many are in octavo, a few in folio. 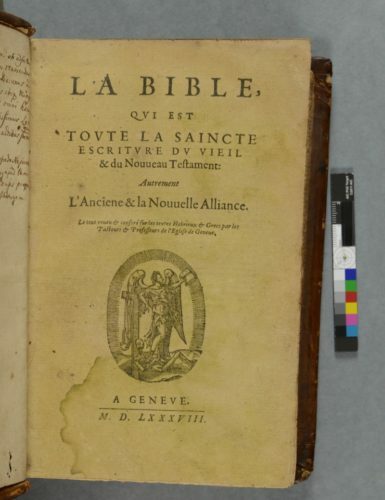 The texts are mostly biblical/devotional and occasionally legal (which are sometimes in French), but they include poetry and other kinds of texts. I reproduced two in my little exhibition on colour in the production of Tudor books at Cambridge UL, https://exhibitions.lib.cam.ac.uk/tudorcolour/case/yellowed-books/ . Given the nature of the reproductions (photography of one only sheet, in isolation, with no colour checker chart or grey card), the images dim the yellow to what may look on screen like normal discolouration. Don’t be misled. In person, it’s a vibrant yellow, sometimes lurid or even acid, and it’s nothing like the familiar yellowing of paper over time. As Pratley observed, the survival of yellow text blocks in contemporary bindings (presumably the textblocks’ first bindings) suggests that the colour is contemporary rather than a later addition (Pratley 1970, 99). I believe it was part of the binding process, not the printing process: the sheets were printed, the text block(s) was assembled, the whole was stained or dyed, and finally the book was bound. The evidence for this comes in Sammelbänder in which the text that have been bound together exhibit a consistent yellow, not different hues. If it were the normal method, textblocks for bindings containing a single title were presumably prepared in the same way. Also, the grimy texture of the more lurid yellow textblocks I’ve consulted would make those papers suboptimal printing surfaces but be of little consequence during binding. In their correspondence in The Book Collector in 1970, James Harner and Harry Pratley agreed that this was done by the binder at ‘a customer’s special order’ (they both used these words) (Harner 1970, 383–84; Pratley 1970, 99). Not all titles in a Sammelband are yellow–Harner reported a binding with four titles tinted ‘a uniformly yellowish colour’ and a fifth on white paper, for instance–and this may indicate a later binding that incorporates (at least a few titles of) what was previously a yellow Sammelband. It may be tempting to dismiss this on the basis that some yellow texts were printed as late as the 1790s, but it is unclear whether the later outliers were made yellow in the same way or for the same purpose. And, of course, their yellow may be a later, antiquarian attempt to capture the earlier aesthetic. Almost all of the text blocks are yellow throughout, with the yellow extending into the gutter, with the odd example of a yellow dedicatory gathering preceding a white text block. The exceptions are folios or whole gatherings with visible striations, which suggest the colour was applied with a broad brush, or are covered in a pale acid green rather than the bright yellow. In the examples I’ve encountered, which may not be representative of any others, those folios or gatherings all seem to be made up. At least, they have different physical characteristics, such as being cut to different dimensions than the rest of the text block. I wonder whether the green may be due to an unintentional colour change over time. In some, I think (but cannot confirm) that pigment deposits are visible on top of the black ink film. This is difficult to determine with the naked eye. Moveable type tends to make for small printed areas, so this tends to be easier to (possibly) observe on larger ink films, for example in solid black areas in woodcut title vignettes. If this is the case, it would confirm that the yellow was applied after printing. Further research is required, however; I want to emphasise that these observations are initial and tentative. Harry Pratley suggested that the colourant was saffron (Pratley 1970, 99), but I believe that no scientific analysis has been taken to date. As it was probably organic, it’s unlikely that it could be determined through any standard imaging techniques. If the yellow were a dye, presumably soluble in water, could the printed sheets have been soaked in ‘yellow water’ in a bath, possibly like that used to dampen sheets before printing? It would be helpful to try this using different materials to determine whether this could yield an even hue and intensity throughout a stack of paper. But, of course, each yellow may have come from a different recipe and been applied in a different way. These yellow text blocks could have been the work of a single bindery, they could represent a lesser-known but established workshop practice across a small or large area, or they could include individual, unrelated attempts to appeal to the yellow-page-craving collecting market. In content, audience, language and geographical focus, this seems unrelated to other printing on coloured paper in the 1500s, including texts and images on carta azzurra, and the odd fifteenth- or sixteenth-century woodcut book wrapper on paper that’s now grey. It may or may not be related to the printing of some copies of books on grey paper – e.g. William Congreve, The Double-Dealer, A Comedy (Printed for Jacob Tonson, at the Judges-Head near the Inner-Temple-Gate in Fleet-Street, 1694), as described by Unger and Jackson 1997, I: 194, no. 194); or on green paper (‘a few English books of this period’; ibid., I: 80–81, no. 67). I’ve been asked whether this is connected to the production of Sanskrit manuscripts with yellow gatherings (see Bodleian MS Wilson 39.a), but I don’t have the expertise to posit a connection. At this point, all I can say is that the mystery remains, and the number of suspects has increased. I’m still at the earliest stage of research, making observations and occasionally wondering how to explain them. If anyone knows of any examples, I’d be delighted to add them to the list (elizabeth.savage@sas.ac.uk). Or if anyone else has been tracking yellow books, by any happy chance, I’d be delighted to share notes. Harner, James L. ‘Bibliographical Notes and Queries: Query 246 (Spring 1970): Early Printed Books on Tinted Paper.’ Book Collector (Autumn 1970): 383–84. Pratley, Harry W. ‘Bibliographical Notes and Queries: Query 246. Early Printed Books on Tinted Paper.’ Book Collector (Spring 1970): 99. Sayle, Charles E. Early English Printed Books in the University Library, Cambridge: 1475 to 1640. Cambridge: Cambridge University Press, 1900–07. •	Nos. 576, 856, 1025, 1151, 1687=7228 (on green paper), 2385, 3171, 6080, 6103, 6694 (as indicated in the index but not necessarily in the descriptions). Unger, Emma V. and William A. Jackson, eds. The Carl H. Pforzheimer Library, English Literature 1475-1700. New Castle, Delaware: Oak Knoll Press, 1997. Upper, Elizabeth. ‘“Yellowed” Books’. In Tudor Colour Printing (Cambridge University Library, Dec 2013–Jan 2014). 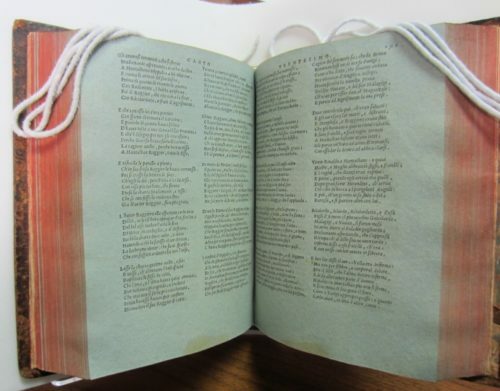 Cambridge University Library Exhibitions, https://exhibitions.lib.cam.ac.uk/tudorcolour/case/yellowed-books/. Wilson, Robert Andrew (Principal Keeper, Department of Printed Books, British Museum, 1959–66). Letter dated 16 Feb 1952. Inserted into Harner. Many thanks for sharing my comments while I was away, Caroline. I’ve added those identified here and in the comments to the other post to my working list, which now numbers 75 titles: https://docs.google.com/spreadsheets/d/1NpGhEf5WWNxtse4Sr2HkuzJNtitBiaC7XGb9UCXfOnI/edit?usp=sharing The titles are on one sheet, and basic analytics are on the other. Please note that this is just a working list. It includes all that I’ve seen described, I haven’t been able to verify many entries, there may be errors, the titles may represent different episodes of yellow-ing, etc. I’ll keep it up to date. The only patterns I can spot are that English titles, mostly Bibles or BCPs (especially key Reformation texts), were yellowed in the mid-late 16C. Since this seems to be a collecting trend, the next steps are to continue expanding the list and to record information about bindings and provenance. I’m not able to do that based on catalogue descriptions, so at this point it seems that the best way to progress to share what I have and ask for help. If anyone has any ideas, or any additional information, I’d be delighted to discuss.